As you know you have an epidemic of concussions with your players on hand so the big question shapes up, what spin do you put on it? This is an imaginary conversation so you don’t have to really pay attention, league speak for I’ll defer. My oldest son, Oriel tried to get into your league- it almost happened. He played three rookie games with the LA Kings. He scored a couple of goals against his peers which is not bad. But then the entire coaching staff got replaced, all that hard work of contacts was erased like a magnetic pulse wiping out a hard drive. But Oriel did get to sit beside Jeremy Roenick for three weeks while with the LA Kings. Did you read Mr Bettman what Mr Roenick has written concerning concussions on nhl.com? Just in case you might have missed it, voila….”We can no longer ignore the stupidity of the hits that are still happening today despite the fact that the players know the concussion aspect is such a big part of the game and sports in general,” Roenick wrote. Here’s what my son told me last night. And now it’s Chris Pronger, Captain of the Flyers’ out for the entire season. The hockey headlines scream: Is Sidney Crosby the next Bobby Orr as premature retirement? Did you know Mr Bettman that registered soccer players in Canada are at one million children, and hockey is now at 300,000 registrations. I don’t think a whole lot of parents will be choosing hockey until something massive is done to reduce concussions. So the situation may self regulate within a generation. There will be no more draft-able high-caliber players to choose from for populating your league. My best advice for improving the protection of player’s brains is what I have already mentioned in a previous blog. Race drivers can walk away from a 20G deceleration crash without a serious concussion like Flyers’, Claude Giroux just recently experienced with a knee to the head by his own player, Wayne Simmonds trying to jump over him. How can that be? How can a driver have a vehicle crumple around him or shred his composite frame structure, yet he is relatively unscathed? How do these drivers do it? It’s their H.A.N.S. device. The head loading after impact deceleration is restricted into non rotation plus the device channels the collision energy into their entire torso, massive enough to withstand and dissipate their collision energy. 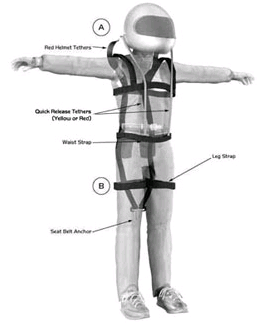 The drivers also have the option of the HUTCHENS device, a bunch of head straps attached to their lower torso, around the pelvis, that perform a similar torso loading away from a head impact. 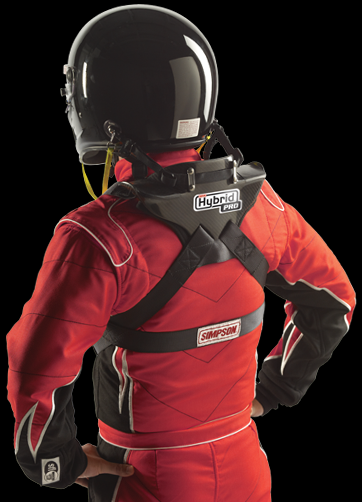 What does a head and neck restraint do? Installation of the Hutchens Device begins by attaching either a single or optional double hook attachment to your helmet. This requires you to drill either one or two holes on each side of the helmet. The Hutchen’s Device then has leg straps and a waist strap that must be fitted to the driver. A tether strap then runs between the driver’s legs and attaches into the existing seat belt latch. Tethers then run from the Hutchens Device up to the hooks you’ve installed on the helmet. The D-Cel is similar to the Hutchens Device, except it doesn’t tie into the seat belts. It relies on the driver’s pelvis for anchoring. As a result, the driver has no attachment into the seat belt system with the D-Cel. For a better understanding of the installation of the Hutchens Device and the D-Cel visit their manufacturer at www.safetysolutions.com. The site allows you to download the actual installation directions. So the other big question of course involves money. What about the fans? But at this point the question is way above what the owners want or demand, what the fans want or demand. Now it’s all about the players. How best to protect them? They are at the source of your money generation. Somehow considering your past behavior I am not too optimistic about you making a great decision toward protecting the players-protecting the game. I’m not sure you can see the tipping point of the league’s survival is now in the pivot frame. No enterprise yet in human existence is permanent, absolutely none. Any tradition can stop in the beat of the heart. There’s much more of course. Make the ice surface larger, Olympic size, enforce mandatory reduction of the hardness of all of the hockey equipment. Mandatory full head protection with a new Hutchens Device specially designed for hockey is all possible. Or return to minimal equipment. That way every hit has consequences instead of deflections, now it’s true contact. It will reintroduce Roenick’s respect, since a heavy hit will have repercussion back onto the hitter. Otherwise this is the beginning of the end, no question. P.S. Here’s the latest Simpson Safety Equipment Head and Neck support device also devised by Trevor Ashline, looks like it could be adapted to a set of shoulder pads, no? The clock is ticking…….